The whole herd is here to say Thanks!! Today I'm sharing this adorable card by Larissa using the new Farmyard Friends stamp set. I love how she fussy cut out all the farm animals and put them into a box that she created! This is so fun! To add even more whimsy, she stamped the "from the whole herd" sentiment into the sign post from the Winter Tails stamp set! I love how this works together! Plus she added those ute google eyes and all the little ears of corn! This card is just so fun! To finish off this card, Larissa also added the little "hello friend" sentiment from the Simply Sentimental stamp set. Thanks so much Larissa for this super fun project today! Please make sure to head over to Larissa's blog, Larissa Heskett Designs to see more of her work and say hello to her today! Hope everyone has a great weekend! Make sure you come back to the blog Monday for SNEAK PEEKS - and next week is our new release so it's going to be an AWESOME WEEK! TODAY is the LAST day to enter our Inky Paws challenge #19 - Use WATERCOLOR! There's still time! 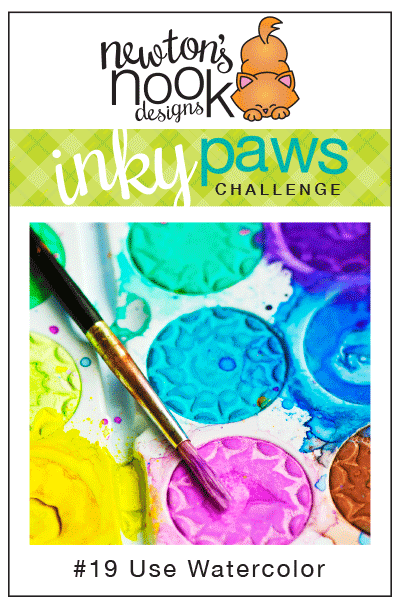 You have until Midnight CST tonight, Friday, April 10th to enter our current inky Paws Challenge. All you need to do is create a card or project with Watercolor & NND products! The watercolor can be paints, pencils, whatever you have! What a delightful card! I love the box and the herd of critters! Ha so so cute!...love this boxful of cuteness. Super fun and ingenious card! This is soo cute!! Love the critters in the box, adorable! Rainbow Floral Thank You card by Nicole Picadura! You Lift me Up, Pup! Inky Paws #19 - WINNERS! Meet our April Guest Designer - Nicole Picadura!